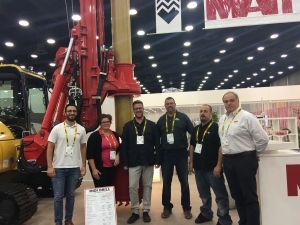 The International Construction and Utility Equipment Exposition (ICUEE – The Demo Expo) is the premiere event for utility industry professionals to gain comprehensive insight into the latest technologies, innovations, and trends affecting their industry. Hands-on demonstrations of a broad range of construction and utility equipment. An education program inspired by the industry’s hottest topics and led by industry professionals. Opportunities to explore the newest industry products and innovations. A chance for attendees to network with thousands of industry peers. The iP Utility Safety Conference & Expo offered nearly 90 hours of educational sessions to choose from, covering everything from new NFPA 70E changes and OSHA rules, to safety leadership and innovative management approaches. These courses will help prepare Ed and Rebecca to pursue a Certified Utility Safety Professional (CUSP) certification. The CUSP has been coined the “Defining Benchmark in Utility Safety” and is the only program that offers safety credentials to utilities, related contractors and communication providers. It is designed to provide a career path and individual growth for employees and increased value for employers.